Waterfalls, cliffs and temples are just a few of the beautiful things you can stumble upon while walking through this park. 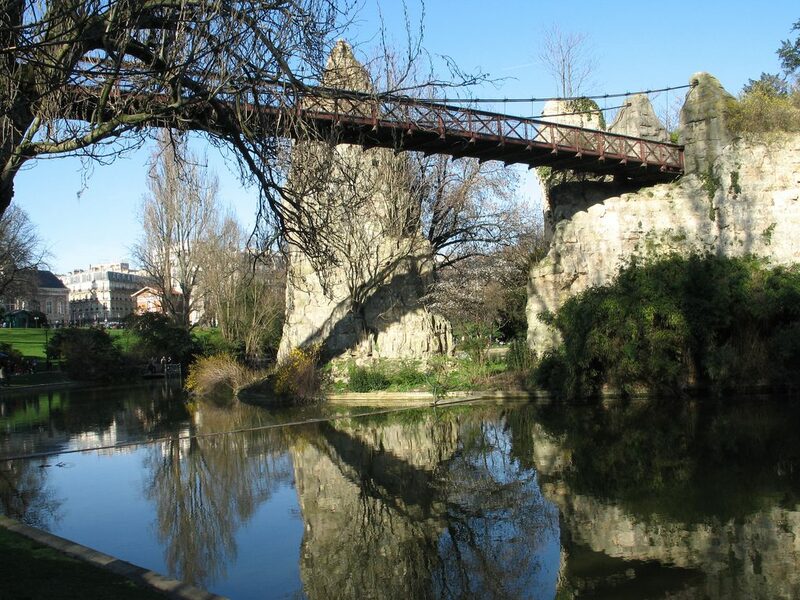 Situated in the 19th arrondissement, tourists usually stay away from the Parc des Buttes-Chaumont, but the locals know it to be one of the best in Paris. It is one of the largest parks in the city, and it is worth a visit. Bring a picnic blanket, a book and relax, or take a stroll through the many paths this park has to offer. The Jardin des Tuileries is Paris’ oldest and largest public garden. It is a formal garden with graveled paths and perfectly manicured lawns, and it has unparalleled views of the Place de la Concorde and the Arc de Triomphe. It was designed by the same architect who designed the gardens at Versailles, so if you have visited the palace you can imagine how splendid the Jardin des Tuileries is. It was declared a UNESCO World Heritage Site in 1991. The Jardin du Luxembourg is located in the 6th arrondissement, and is where the locals go for a run. Why not join them and discover all the statues and artwork the park has to offer while burning those extra calories from all the crepes and cheese? The park was created in 1612 and has since evolved to become the beautiful space it is today: home to six tennis courts and a playground as well as impressive sculptures. Things to be done here include pony rides, sailing your sailboat in the central fountain and enjoying a famous Guignol puppet show. The most important botanical garden in France, the Jardin des Plantes is undoubtedly one of the best parks in Paris. It is home to four museums and conserves a wholly functioning botanical school. It was originally intended to serve as a medicinal herb garden for French royalty, but it quickly became the vast botanical garden it is today. You can explore the thousands and thousands of different plant species in this garden or you can wander around and lose yourself in its maze. A relatively unknown park in Paris, the Anne-Frank Garden was inaugurated in 2007 and is a wonderful hidden gem in the Marais. It is small yet delightful, and is rarely crowded. There is a beautiful pond in the center and romantic trellis-surrounded seats are its most remarkable feature. Although it doesn’t feature extravagant flower arrangements or exotic plants, anyone who has been to Paris will appreciate the calm respite that this garden has to offer. At times you can find art exhibitions on the walls of the garden, adding an extra touch of beauty to the space. Parc Monceau could be considered Paris’ most diverse garden: it has an Egyptian pyramid, Corinthian pillars, a Venetian bridge and a Chinese pagoda among other features. It was created by the Duke of Chartres, a very wealthy aristocrat, and it can be found in the 8th arrondissement. The park is styled in the English manner and is a favorite of the locals, whose children come here to play among the 200-year-old trees while taking in the tranquil beauty of the park. Located on the royal estate of Vincennes, this public park was inaugurated as part of a garden festival in 1969 and is thus one of the newer parks in Paris. It occupies a considerable part of the Bois de Vincennes and is considered the fourth largest park in Paris. There are many things to be done here. The park not only has beautiful annual flower shows, but is also host to an outdoor concert stage, a restaurant, a cafe, an art gallery and a miniature railway. The Parc de Belleville in the 20th arrondissement has one of the most privileged views of the Parisian skylines – you can see the Eiffel Tower from here. Here you can find the longest waterfall in Paris, ping-pong tables, huge lawns where you can sit and relax or have a picnic and even an open-air theatre. There is also a museum dedicated to air pollution at the top of the park. The park’s most notable feature is its flower displays. Established near the River Seine and built on the site of the former Citroën car manufacturing plant, the Parc André Citroën could be described as a modern park: think glass houses, dancing fountains, waterfalls, and gardens with computerized sounds. There is also an astounding elevated reflecting pool and several smaller gardens, each of which is designed around a specific color – blue, green, orange, red, silver and gold. What also makes the park so different is that you can ride its tethered hot air balloon to see some incredible panoramic views of the Champs de Mars, the Sacré Coeur, the Seine and Notre Dame. This garden counts 10 acres where you can experience pure relaxation away from all the hustle and bustle of the French capital. Its different sections are designed to represent typical gardens from different countries all around the world (Japan, England, France, etc), which makes it one of the most unusual parks in Paris. Take part in a great experience in this garden on Tuesdays or Sundays (April, May, June or September): a Japanese tea ceremony is held in the garden’s pavillon du thé.